Update 11/2: Drywall work is nearing completion in LISB 200. The final coat of joint compound is expected to be applied today. Depending on dry-times, it may be necessary for a Facilities Technician to come into the space on Saturday 11/3 to keep the project on schedule for its completion date. Paint and primer are expected to be completed by the end of the working day on Monday 11/5. Additional cleanup time and removal of equipment will likely spill over into the day on Tuesday 11/6. Update 10/31: Work in LISB 200 is under way. Dust containment and negative pressure air-purifiers are in place and functioning. Sheetrock work is progressing and is approximately fifty percent complete. 201 & 204 – Demising wall is still wet and is showing little drying progress. EHS and CPFM have determined that our best course of action is to demolish and replace affected finishes. The current plan will include constructing a dust control containment and air filters, and all removal and replacement work occur with these controls present. Our intent is to reduce dust emissions from this work to the lowest practicable level. The current plan is to wrap up work within 1 – 2 weeks. We believe labs should be able to remain largely functional during this period, with the loudest tasks being completed off-hours. Please feel free to contact me as needed. 303 & 304 – Demising wall is dry. Servpro will remove equipment today. CPFM will make repairs and return the space to normal service in the coming week. Rooms 201B, 303C, 403, 405, 407, & 409 – All drying was successful and is complete. Servpro removed equipment today. 303, 304, & 307 – All casework is dry. Servpro removed equipment today. 303 & 304 – Demising wall is still wet, but is showing progress. Equipment will remain over the weekend and EHS will recheck on Monday, 10-29-2018. We are hopeful that this will dry by then. 201 & 204 – Demising wall is still wet and is showing little progress. Equipment will remain over the weekend and EHS will recheck on Monday, 10-29-2018. Some demolition may be necessary. CPFM will start reconstruction on Monday where they can. At this point, we think that most reconstruction will be completed by Friday next week. That being said, the second floor wall repairs may take longer depending on the final scope. We will be able to provide an update on Monday. The mitigation associated with the LISB water intrusion from October 23, 2018 is anticipated to take between 1 – 2 weeks to be completed. Please feel free to contact EHS if you have any questions. In the early hours of 10/23, a leak occurred within the RO system. In the early hours of October 23, 2018, a water leak occurred within the RO system in LISB room 405. The leak impacted several spaces on the 2nd, 3rd, and 4th floors of the building. Thanks to the quick work of CPFM staff, the impacts were contained and limited to some cabinetry and gypsum board wall finishes in the rooms listed below. The University has retained a mitigation contractor, Servpro, to provide mitigation services for all of the affected spaces. Our current mitigation strategy will be to dry out finishes in place, with minimal demolition. This will include the use of dehumidification equipment and large fans strategically placed throughout affected areas. The equipment will generate heat and a significant amount of noise. It is imperative that it be left running and not tampered with, or mitigation efforts will not be successful. EHS will oversee the dry out phase of the mitigation. Once mitigation has been completed, the space will be reassembled by CPFM staff. Servpro will be setting up mitigation equipment in fourth-floor spaces this afternoon (October 23, 2018), and second and third floor spaces tomorrow (October 24, 2018). Please feel free to contact me if you have any questions or concerns about the mitigation phase of this incident. If any non-building related items were damaged as a result of this incident, contact Risk Management at 541-346-8316. On September 20, 2017, from 5:00 am – 7:00 am the RO Water will be temporarily shut down in Onyx Bridge to allow for plumbing demolition in Onyx 270. This will impact the entire building. Contractors Harvey and Price are performing the work. Due to an emergency RO System leak on the second floor of Huestis, the building RO services are temporarily shut down. This will affect RO services to the entire building. We will send a restore message when services are back online. For questions or concerns please contact CPFM Zone B Maintenance Manager Bruce Budzik at 541-346-8834. 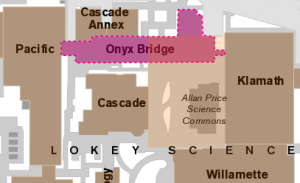 On Thursday, August 3, 2017, from 8:00 am – 4:00 pm the RO Water that services Onyx Bridge and Pacific Hall will be temporarily shut down while crews install a new value in the penthouse in Onyx Bridge. 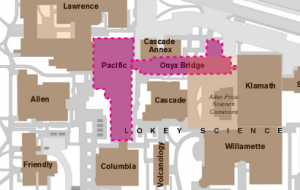 This allows Onyx Bridge and Pacific Hall to be isolated from each other so lines can be capped off as part of the Onyx Bridge second floor remodel project. For questions or concerns, contact CPFM Facilities Services Zone B Maintenance Manager Bruce Budzik at 346-8834. On Friday, July 21st, from 8:00 am to 12:00 noon, R/O water will be shut down in Onyx Bridge. This is for the demolition of connections for the second floor remodel project. 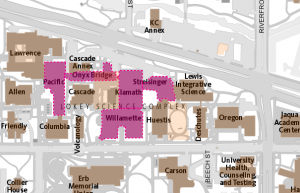 No other buildings or utilities will be affected. 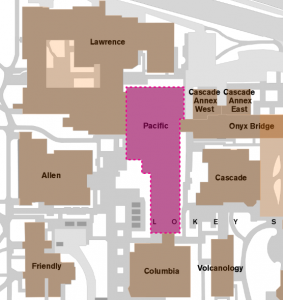 As part of the Pacific Hall Project, the following impacts will be happening starting June 21, 2017 and running through July 7, 2017. Scope: Lab gas will be disconnected temporarily to allow for construction activities. Scope: Lab sink drain lines need to be temporarily disconnected and configured to accommodate construction activities. Scope: Compressed air will be disconnected to allow construction activities. Scope: RO water will temporarily be disconnected to allow for construction activities. Scope: The chilled and hot water will be temporarily disconnected to allow for construction activities. For questions regarding these impacts contact CPFM Design and Construction Nick Pritchard at 612-803-0664 or Jen Miley at 541-346-1530. On Saturday, May 20th from 8:00am until 4:00pm access to the south entrance to Lawrence Hall will be closed for tree trimming by Sperry Tree Care. 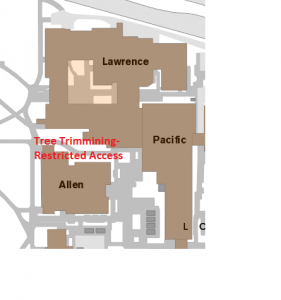 The walkway between Lawrence and Allen will be closed. Loud noise will be intermittent as work is carried out affecting primarily Allen Hall, Lawrence Hall, and Pacific Hall. The Lawrence Hall alley and the walkways connecting to it will be closed or restricted as will access to the south entrance to Lawrence Hall. For questions or concerns please contact Kevin Farthing Zone D Maintenance Manager at 541-346-2857.